My sister and her boy friend, Richard (pure Japanese) invited us for dinner. Richard cooked almost everything. Moreover, he rehearsed the main dish in the previous night. What a crying story. 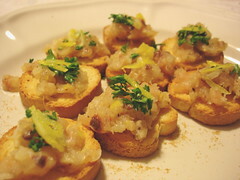 Tuna tartar – slices of Yuzu (Japanese citrus) were on it, yum. 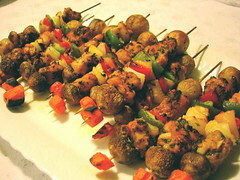 Cooked by my sister, Chicken kebab Pinchos Morunos (Spanish food) – my brother and husband were eating at least 5 skewers each. 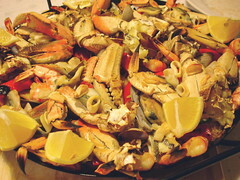 Cooked by Richard, Paella – it was perfectly cooked, thanks for his rehearsal. He bought the pot for this dish as well (T0T). 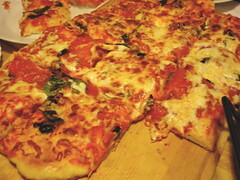 Cooked by Richard, Anchovy Pizza – He made the pizza dough from scratch as well. He wanted to make thinner crust but it was very tastey. 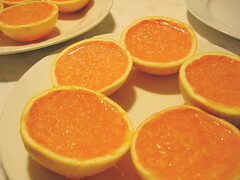 made by my sister, Grapefruit jelly – she made this 100% grapefruit jelly from the grapefruit she scraped out. Very good.